A good supper and dancing capped festivities at a fur trading post on Nov. 19, 1812, in present-day South Dakota. The occasion was to celebrate the completion of building the trading post. John C. Luttig, the post’s clerk, wrote in his journal that the post’s great door had been hung at 4 p.m. in a ceremony that included a salute of seven guns and three rounds of muskets. The post was given the name Fort Manuel. “In the Evening a good Supper and a cheerful glass of whisky was given to the Men, and a Dance at which all the Ladies then in the fort attended, concluded the Day,” Luttig wrote. Manuel was notable for more than a Thanksgiving celebration. The fort was associated with Manuel Lisa, one of the best-known fur traders and entrepreneurs in the early history of the West. “It was Lisa, more than any other man of his era, who established the pattern of trade and commerce in the northern plains and mountains region,” according to a 1977 newsletter of the Historical Preservation Center in Vermillion. Manuel’s system of trade centered on strategically placed posts which enabled exchange with American Indians, security for company operatives and bases for extension. This idea was later perfected by the American Fur Company, but Lisa and his associates dominated the fur trade from approximately 1807-1820, according to the newsletter. Lisa, 1772-1820, was born in New Orleans or Cuba of Spanish parents and came to St. Louis, Mo., in the 1790s. He led the first trading expedition to the upper Missouri River in 1807 and established a fur trading post at the mouth of the Bighorn River. This was Montana’s first trading post and one of many Lisa would build. Lisa and other St. Louis fur traders formed the Missouri Fur Company in 1809. He left St. Louis for the upper Missouri in May 1812, with a party of 87 men and two barges carrying merchandise, cows, hogs, cats, and chickens. These were “perhaps the first domesticated animals ever carried to the upper Missouri,” according to Parker. In August 1812, Lisa selected a site north of the Grand River on the west side of the Missouri River on which to build a fur trading post that would serve as headquarters for himself and his men. Luttig wrote that the location was the third point above Arikara villages and described the site as a beautiful prairie bluff with several bottoms of fine timber around it. The men used this timber to construct a stockade, blacksmith shop, warehouse, living quarters and other buildings. Luttig’s journal tells of daily life at Fort Manuel. American Indians visited the fort daily to trade and to live inside the fort. Some of the men of the fur company were away trading at Indian camps, some as far as 200 miles away. Luttig’s journal entry for Dec. 20, 1812, states that the wife of fur trader Toussaint Charbonneau died of a putrid fever while at Fort Manuel. Many historians believe the woman was Sacagawea, who accompanied the Lewis and Clark Expedition. But by not specifying her name, Luttig left doubt about her identity. Luttig’s last journal entry is on March 5, 1813. It is believed that American Indians attacked the fort that day, causing Lisa and the others at the fort to abandon it. 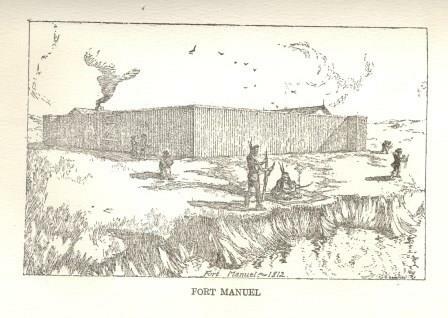 The drawing of Fort Manuel is from a drawing by W.O. Bassford and is from the book “Luttig’s Journal of a Fur-Trading Expedition on the Upper Missouri 1812-1813” edited by Stella M. Drumm, copyright 1920 by Missouri Historical Society.